Anyway, I will be using this thread to document our progress and also I wanted to reach out to our very knowledgable community for ideas, tips and possible resources. it's a very informative and interesting site. I recommend you give it a quick perusal. This looks exciting! How are you planning to twist the ropes tightly enough? With some kind of lever? Also, the tension on both sides will have to be equal, or close too it, so I'd be interested to know how you manage that. cool project. we built a small one in 1998. It was rather neat and could shoot tennis balls two hundred plus feet. a BBC program building the impossible: the roman war machine. Nice video! I had seen images of their final result while researching this topic a bit, but hadn't seen the footage. Looks like an episode I'll have to look up. AK_Brickster wrote: Nice video! I had seen images of their final result while researching this topic a bit, but hadn't seen the footage. Looks like an episode I'll have to look up. Maybe you would want to check w/ your neighbors before launching tennis balls at high speed throughout the town . friskywhiskers wrote: Maybe you would want to check w/ your neighbors before launching tennis balls at high speed throughout the town . Nah, it's easier to ask for forgivness than for permission. Go forth and conquer! Yes, that's what Napoleon Thought. Then he got his **s shipped of to a deserted Island. RAT is the place for Roman Historical stuff online. I'd add only a little, better to overbuild than under. Be aware that in some places having such items is actually illegal. I have lived in many states and a number of countries and I try doing some research to be safe. Since I'm only using a single lego string on each side (doubled up), I didn't really crank up the tension on it. 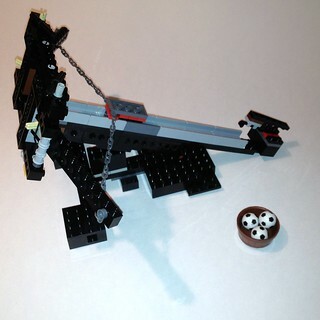 It currently can shoot a Lego soccer ball or my technic axle spear about 6 feet. you kenneled your wife? That's a bit much innit? Just kidding. Awesome project. I love ballistas. Not always sure they're the most efficient siege weapon, but they are very, very cool imo. Looking forward to seeing more of this. And if it's not too personal I'd love a price tag on the build to see if it's worth my while to build a real one, or if I should stick to LEGO.